This is College Physics Answers with Shaun Dychko. We want to find the average intensity of electromagnetic wave that has a certain peak magnetic field strength. 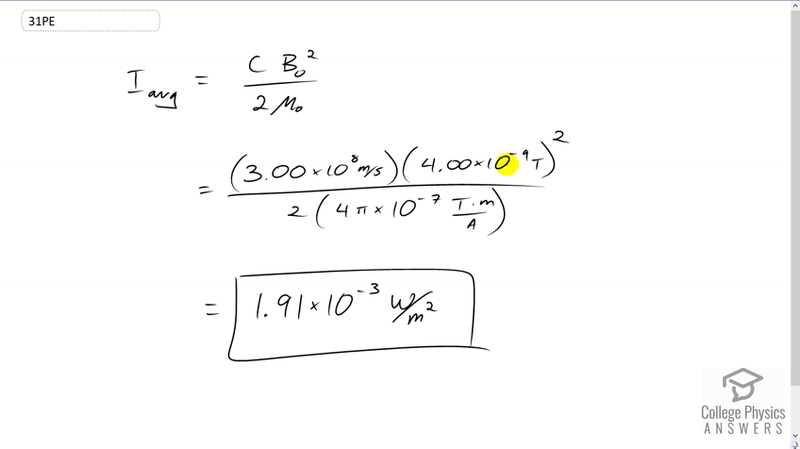 So, we have a formula which says speed of light times magnetic field strength squared divided by two times permeability of free space tells us that intensity. So, that’s three times ten to the eight meter per second times four times ten to the minus nine tesla squared over two times four pi ten to the minus seven tesla meter per amp gives us 1.91 times ten to the minus three watt per square meter.